April 28 (teleSUR) Recent disturbances in Nicaragua have served as a kind of who’s who, separating anti-imperialists from cynical phonies both inside and outside the country. The tsunami of disinformation has swamped the usual suspect mainstream corporate media outlets and their alternative accomplices, but also other news sites that are generally anti-imperialist on issues such as Syria and Palestine, Russia and Iran. Like Venezuela, Nicaragua is in the crosshairs of the Western elites and their governments because its Sandinista President Daniel Ortega and his team have successfully implemented socialist-inspired policies while also defending the principles of a multi-polar world based on international law. The events in Nicaragua resulted from years of frustration and resentment among the political opposition because they cannot win elections. Since 2011, in elections ratified by observers from the U.S. government-dominated Organization of American States and from the European Union, Nicaragua’s political opposition parties have struggled to win more than about 30 percent electoral support. In 2016, President Daniel Ortega was re-elected with about 70 percent of the vote. In recent months, national and international opinion polls have indicated levels of support for President Ortega at well over 60 percent, making the claims of mass rejection of his government look ridiculous. The apparent trigger for the sudden explosion of violence between April 18 and April 22 across the country was the April 16 announcement of reforms to the social security system. Two aspects of that announcement played into the hands of the extremist minority opposition. Firstly, the government mistakenly thought it could announce the reforms due for implementation in July and explain them in detail later to the public. Secondly, the reforms were announced during a university election period with students actively debating and mobilizing around issues of concern to them. That opened the way for the political opposition to mount a vigorous disinformation campaign via social media, cynically fooling large numbers of students into public protests by misrepresenting the government’s pro-worker, pro-pensioner proposals while omitting the private business sector‘s plan to slash benefits, restrict coverage and privatize public sector clinics. On April 18, rival groups of students clashed violently in Managua and then student protesters against the government fought with police trying to restore order. The government condemned the protests, which inflamed the demonstrating students – many of whom have supported the Sandinista government’s very successful social and economic programs. Then from April 19 onward, extremist opposition activists hijacked the student protests, attacking hospitals, government and municipal authority offices, public buildings of all kinds, university precincts and even the brand new national baseball stadium. Among many similar incidents, in the small southern town of Diriamba, hundreds of opposition activists attacked and seriously damaged the municipal offices, which were defended by just 12 police officers. Similar attacks occurred in other cities, including Managua and the northern town of Esteli, where municipal workers occupied their offices to defend them against possible attacks by extremist opposition activists. Esteli’s municipal offices were attacked on the night of April 20 by over 500 people, most of whom were not from Esteli, but including local students and a number of opportunist delinquents. With police trying to keep order, the attackers fired over 1,000 mortar rounds and threw about 17 molotov cocktails trying to destroy the municipal offices and other targets nearby. A total of 18 police and 16 municipal workers were wounded. Among the protesters, two young students were shot dead and numerous people injured. The fighting lasted for five hours, covering an area of about 16 blocks, with the attackers using firearms and knives. While the opposition media blame the police for the deaths, local reporters insist it is impossible to assign blame in such confused events without a detailed investigation. Nationally, most estimates reckon about 20 people were killed in the violence. Among the dead were two police officers and a Sandinista journalist; other fatalities include Sandinista and opposition activists, as well as bystanders caught up in the violence. The pattern of the attacks suggests a well-formulated plan with preparations already in place before the protests started. For example, outside Managua there was no violence reported in important towns such as Matagalpa, Jinotega and Ocotal. By focusing on Masaya, Leon and Esteli, the opposition extremists tried to create false symmetry between their violent offensive and the centers of insurrection against the Somoza dictatorship in 1979. Obvious questions are who may have funded the very widespread attacks, and how were they able to have ready for instant use a quantity of weapons produced on a semi-industrial scale? Overall the attackers fired many thousands of mortar rounds, each one costing over US$3. The cost of transport to move hundreds of militants between Managua, Leon and Chinandega, Esteli and towns around Granada also runs into many thousands of dollars. In Managua, impoverished young delinquents were being paid US$10 to US$15 per day to participate in the attacks. Clearly, the opposition extremists who hijacked the student protests for their own ends were very well organized, funded and prepared before the protests even began. From April 22, numerous sectors – including religious and business sectors – reacted against the violence, increasingly calling for it to stop. In Managua, thousands of ordinary people mobilized extensively to defend their neighborhoods from marauding looters. That day, President Ortega announced the withdrawal of the proposed social security reforms and the start of an inclusive national dialogue. In towns outside Managua, life abruptly returned to something like normal, as if someone had thrown a switch. On April 23, funerals for the dead, as well as protest marches in Managua and elsewhere, went off peacefully. Despite inflated opposition claims, independent media such as El Nuevo Diario reported numbers similar to other big opposition demonstrations of recent years. Scheduled to start over the weekend of April 28-29, the national dialogue is planned to include all sectors of Nicaraguan society and will be mediated by the Catholic church, led by Cardinal Leopoldo Brenes. The government and other authorities are supporting the dialogue by means of a public investigation into the deaths, injuries and damage to property by the Public Prosecution service. The Legal Office for the Defense of Human Rights is establishing a nationwide Committee of Victims for Punishment and Reparations to support people affected by the disturbances. The legislature, the National Assembly, has established a Truth Commission to give a hearing to conflicting accounts of the disturbances. 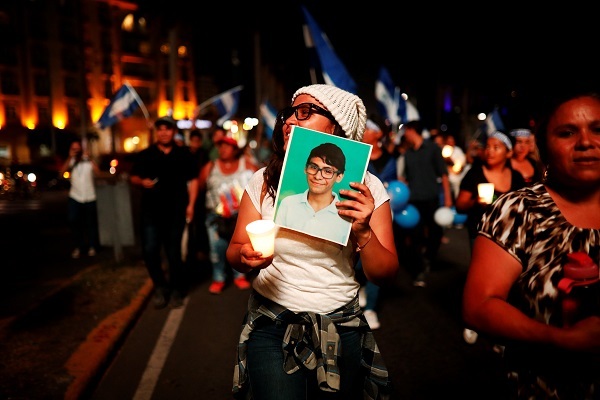 Together with the national dialogue process, these initiatives will help inform people inside and outside Nicaragua of what really happened during the violent incidents that began April 18. Many people in Nicaragua think what will emerge will radically contradict the sinister fictions and false beliefs massively propagated by opposition social media and Western corporate media and NGOs. As the facts emerge, the extremist opposition minority and their agenda promoting U.S. intervention will probably find even more widespread abhorrence and rejection than exists already of what they have done to damage Nicaragua’s hard-won social peace and economic wellbeing.